Few players had better years than Wisconsin’s Eric Baldwin in 2009 and 2010, winning more than $1.51 million then nearly $1.53 million year after year traveling the poker circuit. Things slowed down over the next six years for “Basebaldy,” however, as he moved to Las Vegas and started a family. But now he’s currently enjoying the third-best year of his career. 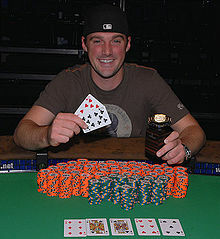 Baldwin made a name for himself in 2009 when he won a $1,500 no-limit hold’em event at the World Series of Poker for $521,991. That same year, he finished third in the $10,000 Pot-Limit Hold’em World Championship for $259,534, and would go on to win CardPlayer‘s 2009 Player of the Year. 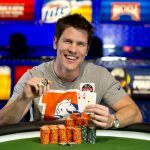 Then, in April 2010, he earned the biggest score of his career ($1,034,715) when he finished runner-up to David Williams in the WPT Five Star World Poker Classic. Other highlights on his poker résumé include winning the 2009 WPT Doyle Brunson Five Diamond World Poker Classic $1,080 event for $256,660, taking down the 2009 Venetian DeepStack Extravaganza $2,500 event for $198,933, and finishing runner-up to Matt Waxman in a 2013 WSOP $1,000 NLHE event for $189,220. So far in 2017, Baldwin has $550,923 in tournament winnings, most of which have come playing local Las Vegas tournaments. That included $188,450 for winning the 2017 Wynn Spring Classic $1,600 Championship Event, a tournament that drew 818 entries. Baldwin defeated UK poker pro Ben Heath in heads-up play to win that title. 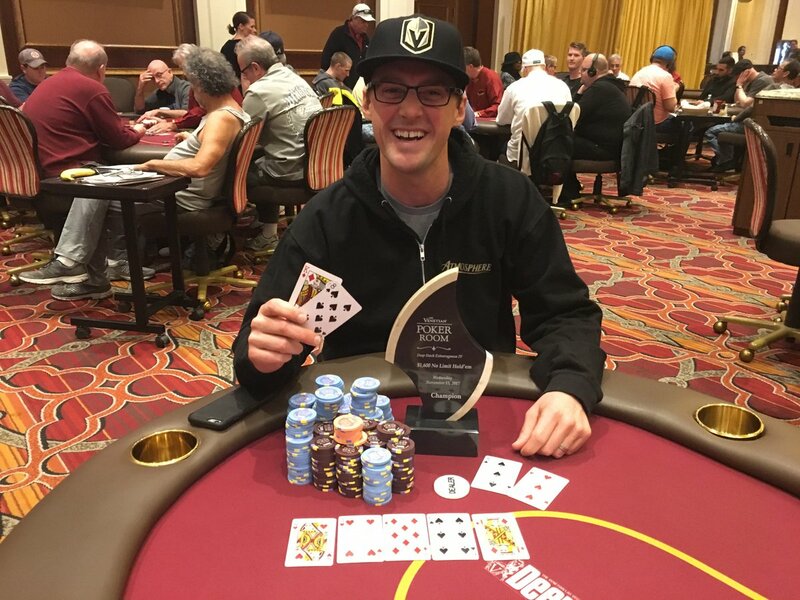 In November, Baldwin prevailed over a field of 345 entries to win a Venetian DeepStack Extravaganza $1,600 No-Limit Hold’em for $114,585. 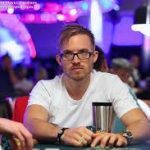 Making the win even more impressive was that he defeated online poker’s most accomplished tournament player, Chris Moorman, in heads-up play. “It’s always fun and challenging to go heads up against an elite player, and Chris is certainly that,” Baldwin said of the win. 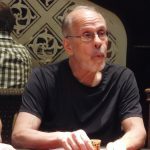 When asked about the defining moment of the tournament, Baldwin was quick to point out a pot during three-handed play. It began when Venerando Villarino limped the button with 6-7 offsuit and Moorman came along from the small blind with the 10♥6♥. Baldwin looked down at the K♥8♥ and checked his option from the big. The flop came A♥5♥3♠. All three players checked and then Moorman tossed out a bet on the 4♣ turn. Both opponents called, and the 2♥ completed the board on the river. Moorman bet, Baldwin raised big, and Villarino called with his 6-high straight. Moorman called, too, with his inferior flush, and Baldwin won a big one. “That crazy hand gave me a pretty commanding chip lead, so the heads-up battle probably wasn’t as much fun as it could have been,” Baldwin reflected. Originally from Wisconsin, Baldwin is now a full-blown Vegas grinder. 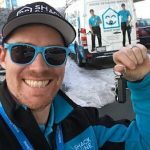 While becoming a family man has its drawbacks, such as a pullback on travel and reduced playing hours, Baldwin has also discovered that it’s come with certain benefits. After that, it’ll be time to turn his attention to the 2018 WSOP, which recently released its summer schedule. It seems that he is doing great. I think he is right when he says it is more difficult playing and being responsable for his family but helped in some other areas. Now i dont know, but i think that if “Venerando Villarino limped the button with 6-7” and table was A♥5♥3♠4♣2♥ he didn’t “called with his 6-high straight” but a 7-high st.
It’s always great to see other CCers doing good! I think that this guy is all we stand for in this great bunch! Poker, fun, values. He makes a good living via poker and is present for his family at the same time. Balance is the key to happiness, right? One thing that is interesting is that the winning people have a good disposition and joy. This means that it is a game of skill and control over your own mindset!